Indian External Affairs Minister Sushma Swaraj. Increasing defence and other linkages with the United States are not at the cost of ties with “friend” Russia, said India’s External Affairs Minister Sushma Swaraj. She was answering a question at her annual press conference on Sunday. “Our close relations and defence ties with the US would not be at the cost of our friends, like Russia,” Swaraj said, answering a question at her annual press conference, in New Delhi on Sunday. Ties with the US are probably at their closest today, she said, expressing happiness that the USA had designated India as a major defence partner. Pursuing these close ties and commitment to expand all facets of the friendship, however, the government would not compromise on issues of national interest and commitments, whether it was with the United States or any other country, Swaraj said. Speaking after the press conference was over, senior official sources said she did not say any more about the relationship with Russia, because she was not asked anything specific. However, the sources said, the relationship is one of the closest India has and nothing will take that away. Speaking about the Indian government’s foreign policy, she mentioned the forthcoming ‘International Day of Yoga’ to be celebrated on June 21. President Putin spoke to ‘India Today’ on the sidelines of the St. Petersburg International Economic Forum. The Indian foreign minister was asked in detail about India’s massive diplomatic efforts to become a member of the Nuclear Suppliers Group (NSG). She said she had spoken personally with her counterparts in 23 of the 48 members of the NSG and was “hopeful” of a consensus happening about India’s entry by the end of this year. Sources informed RIR that one of those Swaraj spoke with is Russian Foreign Minister Sergey Lavrov. A quietly optimistic Swaraj said China, which has been leading the list of countries opposing India’s entry, is “not opposing India” but seeking procedural clarifications. It is opposed to an exception being made for India, Beijing has specified, and is trying to ensure that its close “all weather” ally Pakistan is also admitted. "We hope to become a member of the NSG by year-end. 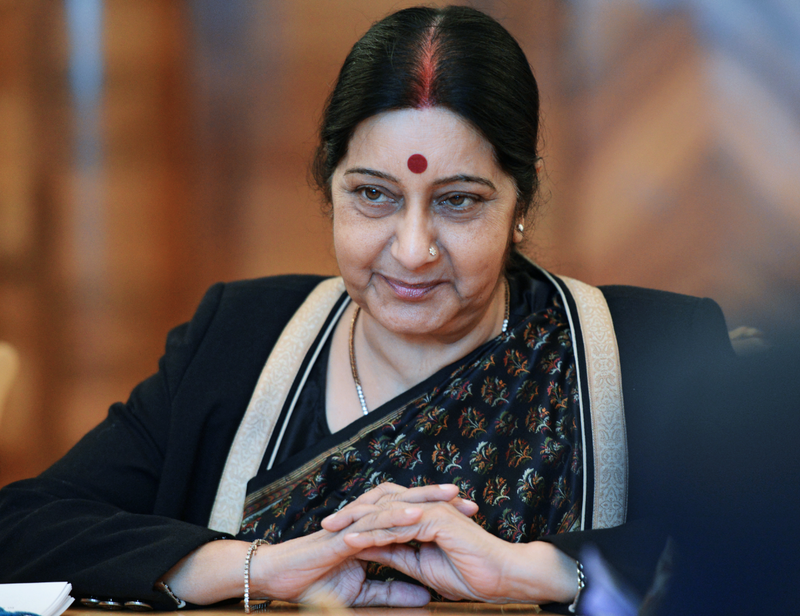 China doesn't oppose India's membership, China is speaking about procedure," Swaraj said. She also said that India’s Foreign Secretary Subrahmanyam Jaishankar, had visited Beijing on June 16 and 17 for bilateral talks during which “all issues, including NSG membership” were discussed. “We will succeed in convincing China too," Ms Swaraj said. China is leading a group of around six countries, including Turkey, New Zealand and South Africa, which have reservations about India being admitted into the NSG. Speaking with ‘India Today, President Putin, who is strongly backing India’s entry into the NSG, revealed that Russia has had "honest discussions on this issue with our Chinese friends and we have no secrets between us. Our cards are open." The NSG plenary meeting in Seoul, Republic of Korea, on June 23 and 24 will discuss India’s application to enter the NSG. India applied in May for entry as a member of the NSG. Terrorism was another issue which came up in the minister’s press conference. In the context of terrorism, particularly emanating from Pakistan, Swaraj mentioned that taken up the issue of Pakistani terror suspect Masood Azhar, head of the Jaish-e-Mohammed group, which is designated by the United Nations as a terrorist group at the Russia India China (RIC) ministerial meeting held in Moscow earlier this year. China had blocked the designation of Azhar, whom India believes is responsible for a terrorist attack in Pathankot air base in January this year, as an international terrorist in the UN 1267 Committee (on terrorism). She said she had taken up the issue both bilaterally with her Russian and Chinese counterparts and also in the trilateral meeting (as RIR had reported). On Syria, Swaraj said, India, like Russia, supported a peaceful resolution of the issue of whether Bashar al-Assad should be replaced, to be decided by the Syrian people themselves, and expressed support for the Geneva talks, when the ISIS terrorists have been quelled.